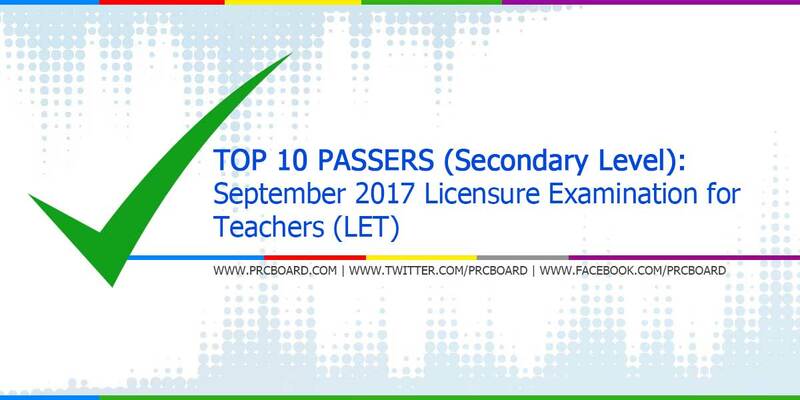 The September 2017 Licensure Exam for Teachers (LET) board exam, conducted by PRC’s Board of Professional Teachers are released 43 working days after the last day of board examination. Aside from the official list of passers, top 10 examinees, top performing schools and performance of schools are also posted. Below is the complete list of LET (Secondary Level) top 10 examinees, courtesy of PRC. While most examinees are asking about the possible release date, as mentioned in the main page of this article, it will be out by November 27, 2017 (Monday). #LET my mouth be filled with thy praise and with thy honour all the day. Godbless LET takers! To God be the Glory! This is the answer to our prayers, LORD! To God be the Glory! pini-pray ko na sana top 1 si Pedrera, Karen S.
Next result name ko naman ang lalabas dito. God bless St. Paul University Philippines ! God bless you all TAKERS! Ginalingan ng peesyu beloved. Congratulations! I hope the next time I'll visit this page, my name will be included in the topnotcher list for secondary. Thy will be done.